For this week's homework, we had to implement huffman's algorithm for the compression of a given string. This is a method for the construction of minimun redundancy codes. 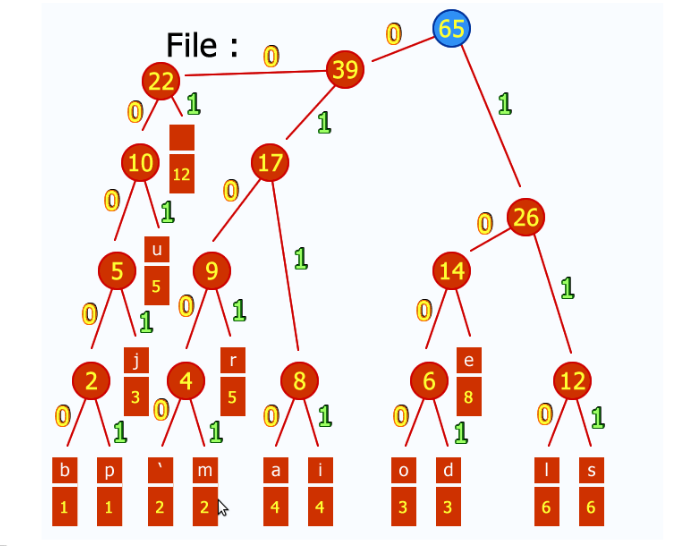 It builds a binary tree with a minimum weighted path length from a set of given weigths. This algorithm is applicable to many forms of data transimission. 1. Scan the text that is going to be compressed, and count the occurrence of each character. 2. Sort characters based on number of occurrences in the text. 3. Bulid Huffman tree based on the list of sorted characters. 4. 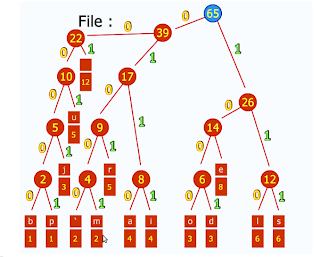 Traverse the tree to determine the code words. 5. Scan text again and create a new text with the code words. Next, is the code where I implemented this algorithms (based on a wikipedia example). As you can see, the code is incomplete. I just reached the point where you get the nodes of the three (next I had to code each letter). And the result of my code is this, where it shows each node with its children. No llegas ni a mostrar que se comprime algo... El reporte está muy lejos de lo que se esperaba. 5+3 pts.